Children make sense of their expanding world through discovery. Reading opens many doors and is the best play adventure of all. Meeting new friends, taking trips to unusual places, learning about komodo dragons and tiny hamsters are all part of the fun. The joy of reading all kinds of books, including both fiction and non-fiction, is as natural as learning to walk and talk. Comprehension is the goal of reading at all grade levels. Having a purpose gives meaning to reading. My purpose is to provide six do anytime, anywhere shortcuts to help your child make sense of the book or reading material, especially non-fiction. Start with one idea. Then add another. Why do I need to know this? Having a purpose provides the framework for understanding. What do I already know about this? Instructor Donna Ogle’s KWL chart from the ‘70s works great! K – What I already know (schema—background knowledge). W – What I want to know (questions). L – What I learned (after reading). When I use this method, I add another W column at the end—What do I want to know now? You can also add another W – Where could I find it? Before you start reading, if your child doesn’t have any schema, stop, make connections and hook into the lesson so it makes sense. Make a prediction about what you think the reading will be about. P – Predict what it will be about. W – Write down your thinking. R – Read to find out if you were right. Summarize at the end of the book, chapter, page, paragraph or line. Use my RCRC organizer. C – Cover the page or close the book. R – Recite or retell. Summarize. C – Check for understanding. Find answers to questions throughout the reading. Raphael’s ’84 Question, Answer, Response (QAR) format helps you. Literal: Right there. Usually the answer is “on the lines”. Questions may begin with list, where, what is, when, how many, name, etc. The correct answer is short. Interpretetive: Look for it. Called “think and search”, your child looks for clues in the text. Summarize, retell, explain helps make a connection between author and student. To make inferences, use experience or make the best guess or opinion. This is the highest level and may challenge your child. Hang in there. Respond to the text by organizing the information, sequencing, noting main ideas and details, writing about it or telling a friend. Finally, and maybe most important of all, be sure to take a “Book Walk” before you start reading, checking out the author, any illustrations, copyright date, special text features, etc. By coaching your child to preview, read, then review, comprehension gets a big boost! P.S. 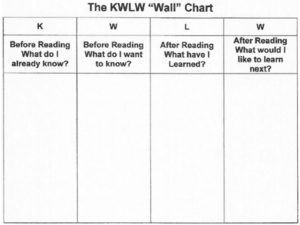 Click here for a free printable KWLW chart!